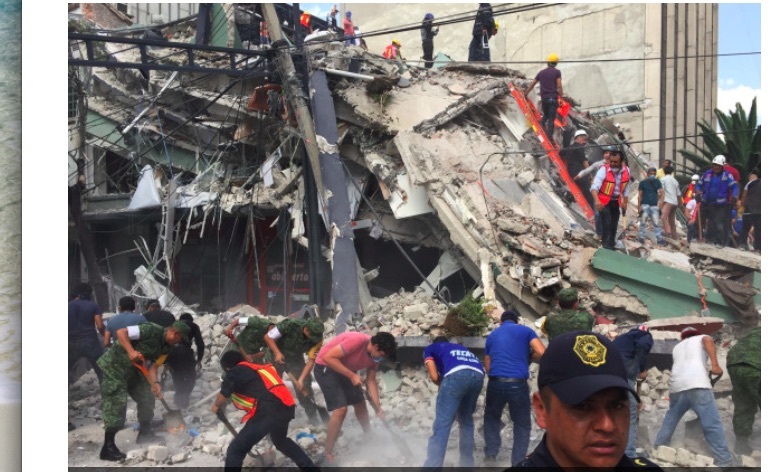 On September 19 and 23, Mexico was shaken by two earthquakes, one of magnitude 7.1 and another of 6.1 on the Richter scale, which struck 5 States and dozens of municipalities, including the capital, Mexico City, collapsing hundreds of houses and producing cracks in hundreds of other buildings. Beautiful churches, like that of St. Francis of Assisi in Puebla, saw their towers demolished. Everyone still remembers the terrible earthquake of 1985 that produced more than ten thousand victims. This, although it has been very strong, killed 360 people. Since then, I have been in Mexico and Puebla, invited to give lectures, and I have been able to verify in situ the ravages and the trauma caused to the people. But what is most remarkable has been the spirit of solidarity and cooperation of the Mexican people. Without anyone to call them, thousands of people, especially youth, began to remove debris to save the buried victims. Groups were spontaneously organized and this spirit of solidarity saved many lives. Immediately, aid collection centers were created for the victims, with water, food, clothes, blankets and all kinds of important utensils for a house. At the time I write this article (10/13/17) many collection sites are still visible. The cooperation knows no limits. Here I only narrate two facts that are especially touching. The first: a school building that collapsed slowly with many children inside. A young man, seeing that a kind of channel had formed in the middle of the ruins, penetrated quickly through the hole and took out several children of 5-7 years. He had barely gotten the last one out when another part of the school fell behind him, saving his life by seconds. Second fact: a young lady, about 30 years old, was 34 hours under the rubble. She granted a moving interview on television, narrating the different phases of her tragedy. Imprisoned in the rubble, a concrete slab was fixed within a few inches of her face. For 30 hours she did not hear any voice, or steps, or any noise that meant the approach of someone who could rescue her. She narrated the different psychological stages, similar to those we know when a patient receives the news of the incurable character of his illness and the proximity of death. At first, this lady asked: why precisely I must go through this misfortune? Then, almost desperate, she began to cry until she had no tears. Then she began to pray and to plead with God and all the saints, especially the Virgin of Guadalupe, the one with the greatest devotion of the Mexicans. Finally, she resigned herself to die and confidently surrendered to the mysterious will of God. But she did not lose hope. like those caused by a sudden earthquake, and giving testimony of her terrible experience. Mexico is a region geologically marked by earthquakes, given the configuration of the tectonic plates of its subsoil. The human being has no power over these enormous forces. What you can do is take precautions, learn to build your buildings to resist earthquakes in the way of the Japanese and, above all, get used to coexisting with this indomitable reality. In a similar way, the population of our semi-arid region of the Northeast, who must adapt and learn to coexist with the drought that can last for many years, as is currently the case. In the debate after a conference at the Universidad Iberoamericana, in Mexico City, one woman declared: “If our country and if all of humanity lived that spirit of solidarity and cooperation, there would be no poor in the world and we would have rescued a part of the lost paradise “. I reinforced her statement and told her that it was the cooperation and solidarity of our anthropoid ancestors, who began to eat together, which allowed them to leap from animality to humanity. What was true yesterday must still be true today. Yes, solidarity and, in general, the cooperation of everyone with everyone will be able to rescue the essence of making us fully human. In recent days, the Mexican people have given us a splendid example of this fundamental truth.